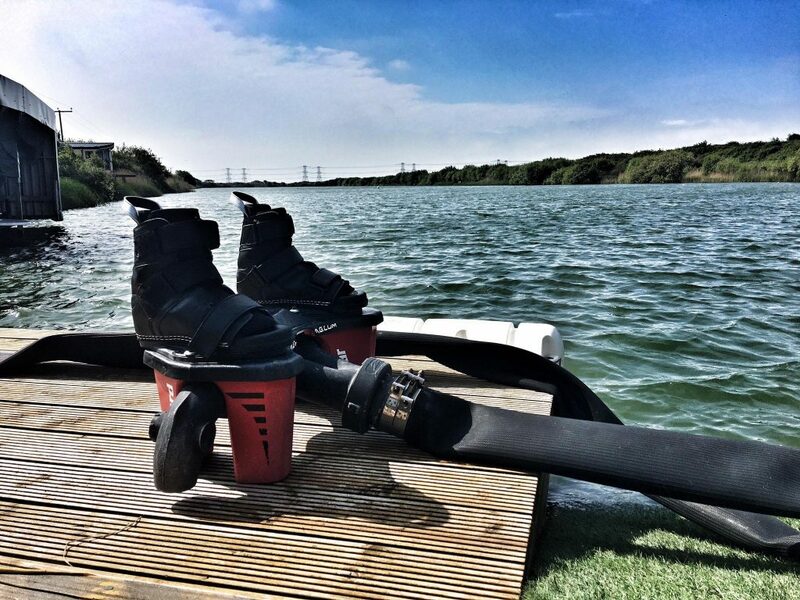 I wanted to share my most recent flyboarding and wakeboarding experience with you in light of my previous post ‘Stay Motivated: 5 Ways to Vary Your Workout Routine’. I figured, after publishing a post about trying new ways of working out and physically challenging yourself, it’s only fitting I should document my new and challenging experience. For me, Flyboarding and Wakeboading was indeed both new and challenging, and an amazing day out which I will always remember. In case you have never heard of it, Flyboarding is a thrilling Water Sports experience. The flyboard itself comprises of a small platform which you stand on, strapped on by special boots. Underneath the platform there are high powered water jets which fire water, creating pressure to lift you vertically up out of the water. The jets are connected via a special hose to the engine and throttle of a nearby jet ski. It has been a massive goal of mine to try this sport for many years and, last week, as a birthday present for my big ’40’, my dream became a reality! 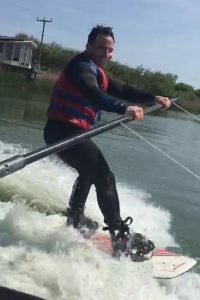 My birthday surprise experience found me at a watersports centre at Lydd in Kent called ‘Action Watersports’. It is an amazing facility set on the side of a beautiful, private lake. The friendliness and welcoming nature of the team was so impressive and everyone (staff and guests) made me feel at ease immediately. Before I knew it, my coach, Simon, & team member, Louis, had rigged me up to the flyboard. I was fully briefed and ready to go… Bobbing away in the water. “I’ve got this”, I said to myself… “No problem”. Without wanting to appear arrogant, I probably have above average balance and stability skills. I can squat on a stability ball, single leg squat on a bosu and have been doing stability/core exercises for years. I thought, this is going to be fun and reasonably easy. 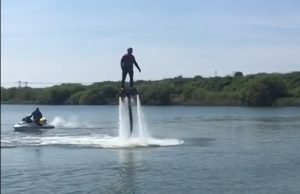 Whilst becoming acquainted with the flyboard was indeed fun, my ego literally came thumping back down to earth quite quickly (and literally, I might add). I didn’t exactly ‘get it’ as quickly as I thought. In fairness, on my first go, I managed to get up above water level and hold my own for longer than I imagined I would. The longer I practiced, however, the harder it got. Again and again I hit the water as I fell from the sky. No discomfort, just a build up of frustration v’s my initial assumption of how easy this should be (never assume anything). Coach Simon’s instructions were to lock my legs out and keep myself ridged. In all my years of stability training, I have always practiced for the knees to be kept slightly bent when in an unstable or load bearing scenario. That may be relevant for dry land but I quickly learnt this is not the case for water sports. The technique is completely different – The more I tried to lock out, the more the learned behaviour of softening my knees kicked in. It was so hard! I had four 15 min sessions and can honestly say, my first was the best of the four in terms of my ability to adapt. Simon picked up I was overthinking it straight away. He was dead right. When I did manage to stay up above water, the feeling was amazing!!! Flyboarding is a remarkable experience like none other I have ever had before… Highly recommend it to anyone comfortable in the water. After lunch, we had my second experience of the day, wakeboarding. 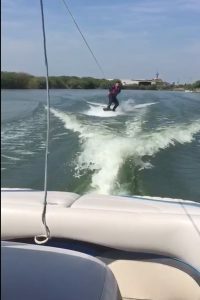 Wakeboarding is like water skiing but on a small surfboard (a bit like a snowboard). Simon’s boat had a special training pole attached to the side for beginners to practice the technique before progressing on to the traditional cable and handle of the back of the boat. Before we set out, Simon gave me a briefing on dry land. My challenge was to sit low and slowly stand while rocking out of a deep squat position, rotating my body from my pelvis as I stood up. “Ok” I thought, “I can do that”… “Erm, No…” came the immediate reply from my subconscious as I attempted it… “You can’t!” (yet). Once again, my fitness based confidence took another bashing as I suddenly realised for this specific task, my flexibility was nowhere near where I wanted it to be. I say “wanted” rather than “needed” because for what Simon was instructing me to do, I could do it, but just about. This, however, was out of my domain of the gym and my comfort levels of familiarity were being challenged yet again. Once in the water, Simon urged me to relax, hold the pole attached to the side of the boat and let the water do the work as I slowly stood up. Once again, my learned behaviours from the gym kicked in. Whilst Simon’s words stayed clear in my head, my body was doing its own thing. As the speedboat dragged me through the water, I found myself pulling towards the bar as if to attempt a ‘chin-up’. My forearm muscles felt like they were going to burst through my wetsuit as I desperately tried to hang on. Simon joked if I kept trying to play tug-of-war the boat, I would never win. He was, of course, right. Several minutes went by and my gym confident body was beginning to tell me I should stay on dry land from now on. Again and again I fell off the pole with water rushing up my nose, down my throat and causing me to splutter and cough. Quite embarrassing and not my finest hour, I must admit! Simon is a brilliant and incredibly encouraging coach. Calm, collected, clear instructions and, most importantly, he stayed patient with me. Something I wasn’t doing with myself. In the end I got it! I managed to convince my body to relax and let the water do the work as instructed. I, eventually, managed to stand and ride the waves from the boat. It felt amazing! ‘Surfing’ on top of the water was incredible and the speed was thrilling to say the least. All the learnings, all the ‘fails’ were all worth it, if only to truly appreciate the exhilaration of wakeboarding once I finally managed it. Success! For me, I feel life teaches us lessons at every opportunity. Apart from an incredible morning of fantastic experiences which I will never forget, I learned a little about myself. Firstly, I learned that there is so much more I can achieve physically. This experience has reframed my fitness regime for the better. The morning highlighted both my strengths and my weaknesses. That for me is a win. My training will now change as the outcome of this new learning. The second thing I learned from the day is to go a bit easier on myself and learn to physically relax more. When outside my comfort zone, I was tense and tight. I found myself using brute force to try and overcome my challenges. It was this same tension and stress that was causing me to fall from the wakeboard in the first place. Once relaxed, both flyboarding and wakeboarding felt effortless, if only for a few seconds. I guess sometimes you just need to breathe and go with the flow for the best outcome possible; To relax and enjoy the experience and leave the perfectionist mindset at home. For an amazing experience and a great day out, I would highly recommend you give either flyboarding or wakeboarding (or both) activities a try. I promise you, you will love it. Finally, I would like to make clear, Action Watersports haven’t asked me to write a review of any kind, publish my experience or offer to sponsor me for this post. I genuinely wanted to share what was an amazing day and a fantastic birthday present. Thank you to Simon, Di and Louis for a truly amazing experience. I am especially grateful for their hospitality, expert coaching, humour and for making my birthday experience truly magical!